Here’s the link to the Weekend Writing Warriors central page, so you can visit all the participants sharing excerpts! Donuts in an Empty Field is a contemporary, realistic fiction, and Young Adult novel about two best friends, the local food challenge, and letting go of anger. This excerpt is from chapter one. After last week when Vanessa first opens the room to her late father’s office, she is tasked with cleaning everything out and boxing everything up with her mom and her best friend, Nichole. Mom dropped a plate in the kitchen, causing Vanessa to panic and get tangled up with Nichole in her attempts to get to her mom as fast as possible. Instead of something sinister, Vanessa finds her mother crying and goes to comfort her. I bend in to hug her and she turns to me with shaking shoulders, sniffling and blinking to stop her tears. “It’ll get easier,” I tell her, patting her on the back. “Grief is a funny thing. It’s never the same and it’s always a tough upward climb, but you’ll get there. It won’t be easy, but you’re strong and you’ll get through it,” Mom assures me, turning back into the parent. Ugh. There’s the canned therapy talk. At least she’s feeling more like herself, even if I don’t. Why does Vanessa have to comfort her mother when they both lost someone? Shouldn’t her mom comfort her? Vanessa is tired of the therapy talk and tells her mom that she and Nichole can handle the rest of the packing. Tune in next week to see what they find behind the torn picture! 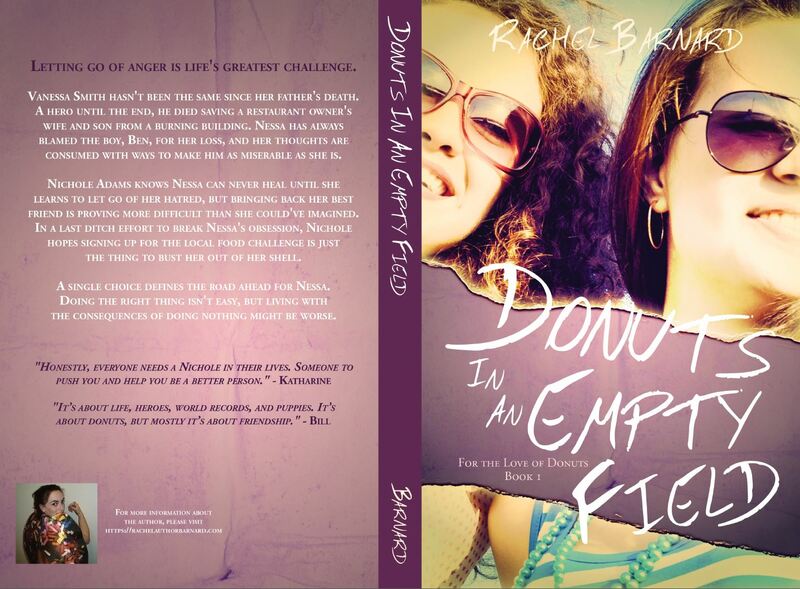 Local young adult writer, Rachel Barnard, will release the first novel in her young adult For the Love of Donuts series titled Donuts in an Empty Field with Life’s a Book Publishing, June 3rd, 2016 (AKA National Donut Day). Order your copy HERE. You’re creating an interesting dynamic between mother and daughter. Old words from a young mouth. I wonder how she has such a handle on the grieving process? Excellent snippet, Rachel! Sometimes a child has to comfort the parent, even when it’s the child that needs comforting. Good job raising the emotions in this snippet, Rachel! They’re both lacking when it comes to helping each other through the grieving process, but that’s what makes everything that much more interesting! That it does! Keep on sharing snippets with us, you’ll build a reader audience! Even if it’s uncomfortable for Vanessa, it’s nice they can comfort each other. Or at least try to! Vanessa gets less and less patient with her mother and her mother’s clumsy comfort as time goes on! Good snippet. I like how the mother’s instinct is to comfort the daughter instead of accepting the support. I can see not liking canned therapy talk, but it’s probably better than not knowing what to say… or saying something really wrong. I’m not sure. Everyone wants and expects something different when it comes to comfort and getting through grief. Definitely a struggle for these characters. Great snippet! Interesting snippet. The one thing about grief is that it is a process, and not linear, and the steps are sometimes repeated, skipped, reversed, etc, and it is different for everyone, which means there is no one right answer and there simply isn’t anything anyone can say that makes the pain go away. Only time can ease the ache and how much time is also an individual thing….just speaking as someone who has lived through a lot of loss and grief. Thanks for that insight Elizabeth! I hope I accurately captured Vanessa’s grief process in this story. Everyone grieves differently and there’s no right or wrong way to do it. I love the premise of this story and really look forward to reading more!